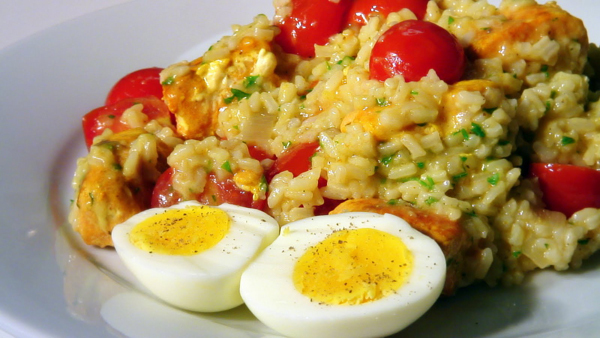 Kedgeree is an Anglo- Indian dish that was created during the Empire – like Coronation Chicken, Mulligatawny soup, and chutneys. It makes a small quantity of fish go a long way and can be kept warm on a hot plate making it ideal for a hot main course as part of a buffet selection. The combination of exotic Eastern spices and the simple Western ingredients of eggs and fish give this dish its unique appeal. Don’t be tempted to over-spice this dish. The natural ingredients have so much flavor you really want them to be in the forefront. 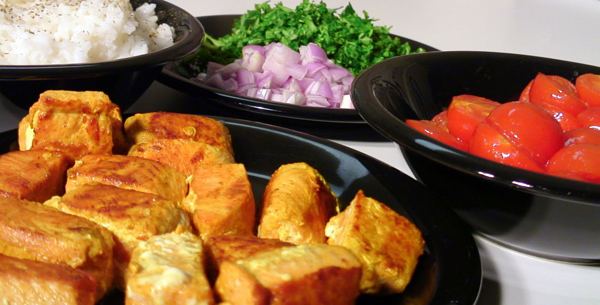 Cut the salmon into chunks, sprinkle with turmeric, then set aside. Put the rice in a pan with 2 cups of cold water. Bring the rice to a boil, then reduce heat and simmer for 7 minutes. We don’t want to fully cook the rice. We just want to blanch it. Once the liquid is absorbed, put the rice in a bowl and sprinkle with saffron, and set aside. Heat 2 Tbsp. of olive oil in a pan and sear the salmon for 1 minute on each side. Remove the fish and set aside to drain on a paper towel. Add 1 Tbsp. 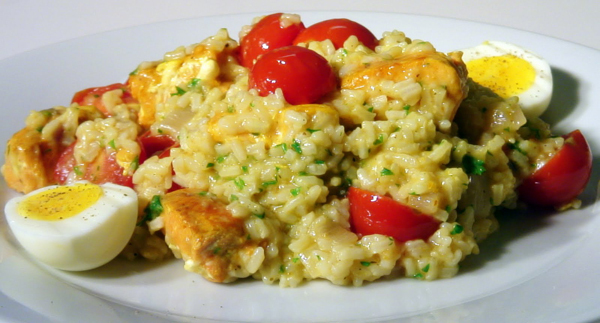 of olive oil and the tomatoes to the same pan and cook for 1-2 minutes. Remove the tomatoes and set aside. Boil the eggs for 7 minutes, shell, halve, and set aside. Bring the vegetable stock to a boil and keep the liquid at a low simmer. Heat the remaining oil, using the same pan as before, and cook the shallots for 2-3 minutes to soften them. Add half of the butter, then the blanched rice, and cook. Stir the rice often to coat with the butter. Add a ladle of hot vegetable stock and stir until the liquid is absorbed. Continue to add the stock in this manner until the rice is fully cooked. Add the remaining butter and stir until melted. Add the salmon, tomatoes, parsley, and salt, gently heat through. 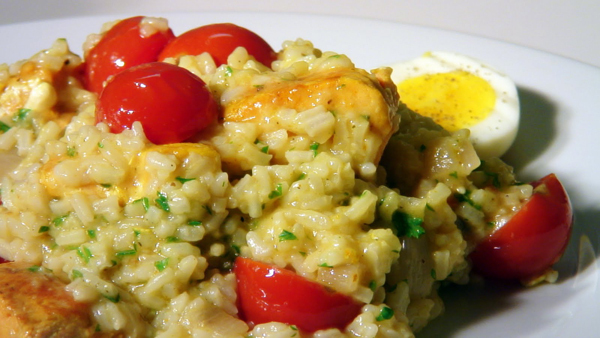 Serve the kedgeree with the halved eggs and freshly cracked pepper.